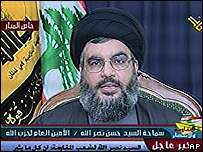 The leader of Hezbollah, Sheikh Hassan Nasrallah, broadcast an extended address on Wednesday 9 August. These are excerpts from his television address. When the prime minister presented the seven-point plan and was discussed in the government, we dealt positively with this plan... The Lebanese Government proposed a seven-point plan, but the Americans and the French responded with the draft resolution that has been submitted to the Security Council. The least that can be said about this draft resolution is that it is unfair and unjust and gives the Israelis more than what they wanted or asked for... this draft resolution in essence wanted to give the Israelis through politics and international pressures what they failed to obtain through fighting. The government's decision on its preparedness to send 15,000 soldiers from the Lebanese Army to be deployed in all this area will greatly help Lebanon and its friends to press for amending the draft resolution, which is being prepared and debated at the Security Council, and will open the way for an appropriate political treatment that can lead to halting the aggression against Lebanon. The deployment of the Lebanese Army will help preserve sovereignty and independence. This is a better and a more appropriate alternative to the deployment of international forces, especially since we do not know which orders they follow or what their mission or duty will be. The killing of civilians, including men, women, and children, is taking place deliberately since it is the only painful method available to this military helpless and bloodthirsty enemy to put pressure on the Lebanese, the resistance, and the state. In addition, there is continued targeting of residential places and systematic destruction of houses and buildings in the southern suburb. For instance, there are vacant buildings, but everyday they come to demolish a number of these buildings. Are these not war crimes? Is not the killing of children and women a war crime? Is not the demolition of vacant buildings that are distant from the battlefield and that are not used in any way and have nothing to do with Hezbollah's leaders and fighters considered a war crime? This is in addition to the continued destruction of what remains of the Lebanese infrastructure. Does anyone believe that all these bridges, roads, and infrastructure were destroyed only to cut off the resistance's supply lines? Is this a logical and reasonable matter or the goal is to destroy the infrastructure to exercise pressure on the Lebanese? The killing of civilians aims to put pressure on the Lebanese and the destruction of houses aims to put pressure on the Lebanese so as to surrender, yield to, and accept the Israeli conditions on the basis of which the war was originally waged. As a matter of fact, it is very regrettable and unsurprising that the Security Council's draft resolutions hold no blame for the Zionists over all their war crimes, massacres, acts of genocide in Lebanon, and systematic destruction of Lebanon. The capture of two Israeli soldiers in a purely military operation deserves all this condemnation and denunciation by the international community, whereas the response which destroyed buildings, killed people, and violated all laws and norms does not deserve any blame. ... We are still holding fast in the field. We are still strong and capable. This, in itself, is a great achievement for the resistance and a big failure for the enemy in achieving the targets they announced with regard to the resistance. We are still fighting in the front villages and frontline. Although, we do not intend to retain territory, the hero and valiant resistance men insist on continuing to fight until the last bullet. Imagine that fighting is continuing in the border town of Ait al-Shaab until this minute. The same thing is happening in other border towns. Your sons and brothers among the mujahideen of the Islamic Resistance are in fact making miracles there and setting an example of heroic and brave jihad that is unprecedented in history. So far, a large number of Merkava tanks have been destroyed. This point is important. Over 60 Merkava tanks and a large number, scores of military bulldozers and scores of military personnel carriers have been destroyed so far. More than 100 tanks, armoured personnel carriers, and military bulldozers have been destroyed until this hour. I will not speak about the killed and wounded among the settlers [Israelis], but I will speak about the officers and soldiers. So far, more than 100 officers and soldiers have been killed and more than 400 officers and soldiers have been wounded in the confrontations, dozens of them are in critical condition, as admitted by the enemy itself. This concerns the ground confrontation. As for the rocket bombardment, the activity of the resistance is still the way it was in the first days. When Olmert said that Hezbollah was no longer the way it was, your sons and brothers, the mujahideen of the resistance, answered him by 350 rockets, which fell on various Zionist military bases and colonies in northern occupied Palestine [Israel]. Until this moment, the enemy has failed to reduce or weaken this rocket capability that is available to Hezbollah and the resistance. Consequently, the residents of these areas have remained in shelters and a large number of them have left. This is in addition to significant economic, material, financial, and human losses, which the enemy is still hiding. Notice that throughout the previous Arab wars, the Israelis used to declare their losses, while the Arabs used to hide them. But today, when Lebanon is bombed, buildings are destroyed, martyrs fall, massacres are committed, despite the negative psychological impact of these scenes sometimes, everything is declared. The Zionists, meanwhile, are hiding everything. Where do hundreds of rockets fall? So far, they have spoken about more than 3,000 rockets that have fallen on them. We assert to you that these rockets are guided by God and are guided technically and are not fired indiscriminately. In all events, the Israelis have so far not managed to control the border strip, which they said they want to go back to, as the case was previously¿ Nonetheless, I tell the Zionists: You can come to any place; you can stage an incursion; land your airborne troops; and enter this village or that point. However, all of this will cost you a great deal. You will not be able to stay on our land. If you enter it, we will drive you out by force. We will turn the land of our precious south into a graveyard for the Zionist invaders. To the Arabs of Haifa I have a special message. I say that we have been pained and are still pained for the loss of your martyrs and for your wounded. I urge you, I appeal to you to leave this city. I hope you would do that. In the past, your presence there and what happened to you has made us hesitate in attacking this city... Please spare us this hesitation and spare your blood, which is our blood, and leave this city.